^ a b c d e f g h i j k l m n o p 米国内科学会 2017. ^ a b c Koes, BW; van Tulder, M; Lin, CW; Macedo, LG; McAuley, J; Maher, C (December 2010). “An updated overview of clinical guidelines for the management of non-specific low back pain in primary care.”. European Spine Journal 19 (12): 2075–94. doi:10.1007/s00586-010-1502-y. PMID 20602122. ^ a b c d Menezes Costa Lda, C; Maher, CG; Hancock, MJ; McAuley, JH; Herbert, RD; Costa, LO (2012-08-07). “The prognosis of acute and persistent low-back pain: a meta-analysis.”. CMAJ : Canadian Medical Association journal = journal de l'Association medicale canadienne 184 (11): E613-24. doi:10.1503/cmaj.111271. PMC: 3414626. PMID 22586331. https://www.ncbi.nlm.nih.gov/pmc/articles/PMC3414626/. ^ a b c d e f g h i “A systematic review of the global prevalence of low back pain”. Arthritis Rheum. 64 (6): 2028–37. (June 2012). doi:10.1002/art.34347. PMID 22231424. ^ a b c d Vos, T (2012-12-15). “Years lived with disability (YLDs) for 1160 sequelae of 289 diseases and injuries 1990–2010: a systematic analysis for the Global Burden of Disease Study 2010.”. Lancet 380 (9859): 2163–96. doi:10.1016/S0140-6736(12)61729-2. PMID 23245607. ^ a b Vinod Malhotra; Yao, Fun-Sun F.; Fontes, Manuel da Costa (2011). Yao and Artusio's Anesthesiology: Problem-Oriented Patient Management. Hagerstwon, MD: Lippincott Williams & Wilkins. pp. Chapter 49. ISBN 1-4511-0265-8. http://books.google.ca/books?id=qOhuwkoN15MC&pg=PT1390. ^ a b c d e f g Casazza, BA (2012-02-15). “Diagnosis and treatment of acute low back pain”. American family physician 85 (4): 343?50. PMID 22335313. ^ a b c 世界保健機関 1999, pp. 81-83. ^ Ehrlich GE (2003). “Back pain”. J Rheumatol Suppl 67: 26–31. PMID 12926648. ^ a b Nachemson (1976). “The lumbar spine an orthopedic challenge”. Spine 1: 59-71. NAID 10020592612. http://journals.lww.com/spinejournal/Abstract/1976/03000/The_Lumbar_Spine_An_Orthopaedic_Challenge.9.aspx. ^ a b Wilke HJ, Neef P, Caimi M, Hoogland T, Claes LE (April 1999). “New in vivo measurements of pressures in the intervertebral disc in daily life”. Spine 24 (8): 755–62. PMID 10222525. ^ Lethem J, Slade PD, Troup JD, Bentley G (1983). “Outline of a Fear-Avoidance Model of exaggerated pain perception--I”. Behav Res Ther 21 (4): 401–8. PMID 6626110. ^ Leeuw M, Goossens ME, Linton SJ, Crombez G, Boersma K, Vlaeyen JW (2007). “The fear-avoidance model of musculoskeletal pain: current state of scientific evidence”. J Behav Med 30 (1): 77–94. doi:10.1007/s10865-006-9085-0. PMID 17180640. ^ Waddell G, Newton M, Henderson I, Somerville D, Main CJ (1993). “A Fear-Avoidance Beliefs Questionnaire (FABQ) and the role of fear-avoidance beliefs in chronic low back pain and disability”. Pain 52 (2): 157–68. PMID 8455963. ^ Davis PC, Wippold II FJ, Cornelius RS, et al. (2011). American College of Radiology ACR Appropriateness Criteria ? Low Back Pain. オリジナルの2012-07-04時点によるアーカイブ。. https://web.archive.org/web/20120704075652/http://www.acr.org/~/media/ACR/Documents/AppCriteria/Diagnostic/LowBackPain.pdf. ^ a b c d e f g h i j k Manusov EG (September 2012). “Evaluation and diagnosis of low back pain”. Prim. Care 39 (3): 471?9. doi:10.1016/j.pop.2012.06.003. PMID 22958556. ^ North American Spine Society (February 2013), “Five Things Physicians and Patients Should Question”, Choosing Wisely: an initiative of the ABIM Foundation (North American Spine Society), http://www.choosingwisely.org/doctor-patient-lists/north-american-spine-society/ 2013年3月25日閲覧。 , which cites* Chou, R; Qaseem, A; Snow, V; Casey, D; Cross JT, Jr; Shekelle, P; Owens, DK; Clinical Efficacy Assessment Subcommittee of the American College of, Physicians; American College of, Physicians; American Pain Society Low Back Pain Guidelines, Panel (2007-10-02). “Diagnosis and treatment of low back pain: a joint clinical practice guideline from the American College of Physicians and the American Pain Society.”. Annals of internal medicine 147 (7): 478?91. doi:10.7326/0003-4819-147-7-200710020-00006. PMID 17909209. Forseen, SE; Corey, AS (Oct 2012). “Clinical decision support and acute low back pain: evidence-based order sets.”. Journal of the American College of Radiology : JACR 9 (10): 704?712.e4. doi:10.1016/j.jacr.2012.02.014. PMID 23025864. ^ Williams CM, Henschke N, Maher CG, et al. (2013). “Red flags to screen for vertebral fracture in patients presenting with low-back pain”. Cochrane Database of Systematic Reviews 1: CD008643. doi:10.1002/14651858.CD008643.pub2. PMID 23440831. ^ Henschke N, Maher CG, Ostelo RW, de Vet HC, Macaskill P, Irwig L (2013). “Red flags to screen for malignancy in patients with low-back pain”. Cochrane Database of Systematic Reviews 2: CD008686. doi:10.1002/14651858.CD008686.pub2. PMID 23450586. ^ a b c Downie, A.; Williams, C. M.; Henschke, N.; Hancock, M. J.; Ostelo, R. W. J. G.; de Vet, H. C. W.; Macaskill, P.; Irwig, L.; van Tulder, M. W.; Koes, B. W.; Maher, C. G. (2013-12-11). “Red flags to screen for malignancy and fracture in patients with low back pain: systematic review”. BMJ 347 (dec11 1): f7095?f7095. doi:10.1136/bmj.f7095. PMID 24335669. ^ Manchikanti L, Glaser SE, Wolfer L, Derby R, Cohen SP (2009). “Systematic review of lumbar discography as a diagnostic test for chronic low back pain”. Pain Physician 12 (3): 541–59. PMID 19461822. 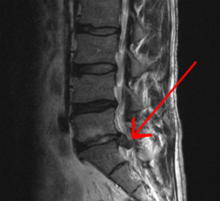 ^ a b c d Use of imaging studies for low back pain: percentage of members with a primary diagnosis of low back pain who did not have an imaging study (plain x-ray, MRI, CT scan) within 28 days of the diagnosis. Agency for Healthcare Research and Quality. (2013). http://www.qualitymeasures.ahrq.gov/content.aspx?id=38884 2013年6月11日閲覧。. ^ Chou, R; Fu, R; Carrino, JA; Deyo, RA (2009-02-07). “Imaging strategies for low-back pain: systematic review and meta-analysis.”. Lancet 373 (9662): 463–72. doi:10.1016/S0140-6736(09)60172-0. PMID 19200918. ^ Crownover BK, Bepko JL (April 2013). “Appropriate and safe use of diagnostic imaging”. Am Fam Physician 87 (7): 494–501. PMID 23547591. ^ a b Chou, R; Qaseem, A, Owens, DK, Shekelle, P, Clinical Guidelines Committee of the American College of, Physicians (2011-02-01). “Diagnostic imaging for low back pain: advice for high-value health care from the American College of Physicians”. Annals of Internal Medicine 154 (3): 181–9. doi:10.1059/0003-4819-154-3-201102010-00008. PMID 21282698. ^ Flynn TW, Smith B, Chou R (November 2011). “Appropriate use of diagnostic imaging in low back pain: a reminder that unnecessary imaging may do as much harm as good”. J Orthop Sports Phys Ther 41 (11): 838–46. doi:10.2519/jospt.2011.3618. PMID 21642763. ^ a b c Deyo, RA; Mirza, SK; Turner, JA; Martin, BI (2009). “Overtreating Chronic Back Pain: Time to Back Off?”. Journal of the American Board of Family Medicine : JABFM 22 (1): 62–8. doi:10.3122/jabfm.2009.01.080102. PMC: 2729142. PMID 19124635. https://www.ncbi.nlm.nih.gov/pmc/articles/PMC2729142/. ^ Buchbinder R, Jolley D, Wyatt M (2001). “2001 Volvo Award Winner in Clinical Studies: Effects of a media campaign on back pain beliefs and its potential influence on management of low back pain in general practice”. Spine 26 (23): 2535–42. PMID 11725233. ^ a b c 日本学会ガイドライン 2012. ^ a b c d e f g h i Miller SM (September 2012). “Low back pain: pharmacologic management”. Prim. Care 39 (3): 499–510. doi:10.1016/j.pop.2012.06.005. PMID 22958559. ^ Coxib and traditional NSAID Trialists' (CNT), Collaboration; Bhala, N; Emberson, J; Merhi, A; Abramson, S; Arber, N; Baron, JA; Bombardier, C; Cannon, C; Farkouh, ME; FitzGerald, GA; Goss, P; Halls, H; Hawk, E; Hawkey, C; Hennekens, C; Hochberg, M; Holland, LE; Kearney, PM; Laine, L; Lanas, A; Lance, P; Laupacis, A; Oates, J; Patrono, C; Schnitzer, TJ; Solomon, S; Tugwell, P; Wilson, K; Wittes, J; Baigent, C (2013-08-31). “Vascular and upper gastrointestinal effects of non-steroidal anti-inflammatory drugs: meta-analyses of individual participant data from randomised trials.”. Lancet 382 (9894): 769–79. doi:10.1016/S0140-6736(13)60900-9. PMC: 3778977. PMID 23726390. https://www.ncbi.nlm.nih.gov/pmc/articles/PMC3778977/. ^ Machado, GC; Maher, CG; Ferreira, PH; Pinheiro, MB; Lin, CW; Day, RO; McLachlan, AJ; Ferreira, ML (2015-03-31). “Efficacy and safety of paracetamol for spinal pain and osteoarthritis: systematic review and meta-analysis of randomised placebo controlled trials.”. BMJ (Clinical research ed.) 350: h1225. PMID 25828856. ^ Chaparro, LE; Furlan, AD; Deshpande, A; Mailis-Gagnon, A; Atlas, S; Turk, DC (2014-04-01). “Opioids compared with placebo or other treatments for chronic low back pain: an update of the Cochrane Review.”. Spine 39 (7): 556–63. doi:10.1097/BRS.0000000000000249. PMID 24480962. ^ Franklin, G. M. (2014-09-29). “Opioids for chronic noncancer pain: A position paper of the American Academy of Neurology”. Neurology 83 (14): 1277–1284. doi:10.1212/WNL.0000000000000839. ^ de Leon-Casasola OA (March 2013). “Opioids for chronic pain: new evidence, new strategies, safe prescribing”. Am. J. Med. 126 (3 Suppl 1): S3–11. doi:10.1016/j.amjmed.2012.11.011. PMID 23414718. ^ Chou R, Loeser JD, Owens DK, Rosenquist RW, Atlas SJ, Baisden J, Carragee EJ, Grabois M, Murphy DR, Resnick DK, Stanos SP, Shaffer WO, Wall EM; American Pain Society Low Back Pain Guideline Panel (2009). “Interventional therapies, surgery, and interdisciplinary rehabilitation for low back pain: An evidence-based clinical practice guideline from the American Pain Society”. Spine 34 (10): 1066–77. doi:10.1097/BRS.0b013e3181a1390d. PMID 19363457. ^ Pinto, RZ; Maher, CG; Ferreira, ML; Hancock, M; Oliveira, VC; McLachlan, AJ; Koes, B; Ferreira, PH (2012-12-18). “Epidural corticosteroid injections in the management of sciatica: a systematic review and meta-analysis.”. Annals of Internal Medicine 157 (12): 865–77. doi:10.7326/0003-4819-157-12-201212180-00564. PMID 23362516. ^ 世界保健機関 1999, p. 26. ^ 欧州の腰痛診療ガイドライン 2006, pp. 158-177. ^ a b c 英国国立医療技術評価機構 2009, Chapt.1.6. ^ a b c d e f g h i j Manusov, EG (September 2012). “Surgical treatment of low back pain.”. Primary care 39 (3): 525–31. doi:10.1016/j.pop.2012.06.010. PMID 22958562. ^ a b c Chou R, Baisden J, Carragee EJ, Resnick DK, Shaffer WO, Loeser JD (May 2009). “Surgery for low back pain: a review of the evidence for an American Pain Society Clinical Practice Guideline”. Spine 34 (10): 1094–109. doi:10.1097/BRS.0b013e3181a105fc. PMID 19363455. ^ Lee, CS; Hwang, CJ; Lee, DH; Kim, YT; Lee, HS (March 2011). “Fusion rates of instrumented lumbar spinal arthrodesis according to surgical approach: a systematic review of randomized trials.”. Clinics in orthopedic surgery 3 (1): 39–47. doi:10.4055/cios.2011.3.1.39. PMC: 3042168. PMID 21369477. https://www.ncbi.nlm.nih.gov/pmc/articles/PMC3042168/. ^ Choi BK, Verbeek JH, Tam WW, Jiang JY (2010). Choi, Brian KL. ed. “Exercises for prevention of recurrences of low-back pain”. Cochrane Database of Systematic Reviews (1): CD006555. doi:10.1002/14651858.CD006555.pub2. PMID 20091596. ^ Hendrick P, Milosavljevic S, Hale L, et al. (March 2011). “The relationship between physical activity and low back pain outcomes: a systematic review of observational studies”. Eur Spine J 20 (3): 464?74. doi:10.1007/s00586-010-1616-2. PMC: 3048226. PMID 21053026. https://www.ncbi.nlm.nih.gov/pmc/articles/PMC3048226/. ^ Hendrick P, Te Wake AM, Tikkisetty AS, Wulff L, Yap C, Milosavljevic S (October 2010). “The effectiveness of walking as an intervention for low back pain: a systematic review”. Eur Spine J 19 (10): 1613?20. doi:10.1007/s00586-010-1412-z. PMC: 2989236. PMID 20414688. https://www.ncbi.nlm.nih.gov/pmc/articles/PMC2989236/. ^ French, SD. ; Cameron, M.; Walker, BF. ; Reggars, JW. ; Esterman, AJ. (2006). “Superficial heat or cold for low back pain.”. Cochrane Database of Systematic Reviews (1): CD004750. doi:10.1002/14651858.CD004750.pub2. PMID 16437495. ^ a b van Middelkoop M, Rubinstein SM, Kuijpers T, Verhagen AP, Ostelo R, Koes BW, van Tulder MW (2011). “A systematic review on the effectiveness of physical and rehabilitation interventions for chronic non-specific low back pain”. Eur Spine J 20 (1): 19?39. doi:10.1007/s00586-010-1518-3. PMC: 3036018. PMID 20640863. https://www.ncbi.nlm.nih.gov/pmc/articles/PMC3036018/. ^ a b Guild DG (September 2012). “Mechanical therapy for low back pain”. Prim. Care 39 (3): 511?6. doi:10.1016/j.pop.2012.06.006. PMID 22958560. ^ Seco J, Kovacs FM, Urrutia G (October 2011). “The efficacy, safety, effectiveness, and cost-effectiveness of ultrasound and shock wave therapies for low back pain: a systematic review”. Spine J 11 (10): 966?77. doi:10.1016/j.spinee.2011.02.002. PMID 21482199. ^ Ebadi, S.; Henschke, N.; Nakhostin Ansari, N.; Fallah, E.; van Tulder, MW. (2014). “Therapeutic ultrasound for chronic low-back pain.”. Cochrane Database Syst Rev 3: CD009169. doi:10.1002/14651858.CD009169.pub2. PMID 24627326. ^ Smith C, Grimmer-Somers K. (2010). “The treatment effect of exercise programmes for chronic low back pain”. J Eval Clin Pract 16 (3): 484?91. doi:10.1111/j.1365-2753.2009.01174.x. PMID 20438611. ^ van Middelkoop M, Rubinstein SM, Verhagen AP, Ostelo RW, Koes BW, van Tulder MW (2010). “Exercise therapy for chronic nonspecific low-back pain”. Best Pract Res Clin Rheumatol 24 (2): 193?204. doi:10.1016/j.berh.2010.01.002. PMID 20227641. ^ Woodman, JP; Moore, NR (January 2012). “Evidence for the effectiveness of Alexander Technique lessons in medical and health-related conditions: a systematic review.”. International journal of clinical practice 66 (1): 98?112. doi:10.1111/j.1742-1241.2011.02817.x. PMID 22171910. ^ Posadzki, P; Ernst, E (September 2011). “Yoga for low back pain: a systematic review of randomized clinical trials.”. Clinical rheumatology 30 (9): 1257?62. doi:10.1007/s10067-011-1764-8. PMID 21590293. ^ Dubinsky, R. M.; Miyasaki, J. (2009). “Assessment: Efficacy of transcutaneous electric nerve stimulation in the treatment of pain in neurologic disorders (an evidence-based review): Report of the Therapeutics and Technology Assessment Subcommittee of the American Academy of Neurology”. Neurology 74 (2): 173?6. doi:10.1212/WNL.0b013e3181c918fc. PMID 20042705. ^ Sahar T, Cohen MJ, Uval-Ne'eman V, et al. (April 2009). “Insoles for prevention and treatment of back pain: a systematic review within the framework of the Cochrane Collaboration Back Review Group”. Spine 34 (9): 924?33. doi:10.1097/BRS.0b013e31819f29be. PMID 19359999. ^ Nizard J, Raoul S, Nguyen JP, Lefaucheur JP (October 2012). “Invasive stimulation therapies for the treatment of refractory pain”. Discov Med 14 (77): 237?46. PMID 23114579. ^ Stanton, TR; Latimer, J; Maher, CG; Hancock, MJ (April 2010). “How do we define the condition 'recurrent low back pain'? A systematic review.”. European spine journal : official publication of the European Spine Society, the European Spinal Deformity Society, and the European Section of the Cervical Spine Research Society 19 (4): 533–9. doi:10.1007/s00586-009-1214-3. PMID 19921522. ^ a b Chou, R; Shekelle, P (2010). “Will this patient develop persistent disabling low back pain?”. JAMA: the Journal of the American Medical Association 303 (13): 1295–302. doi:10.1001/jama.2010.344. PMID 20371789. ^ a b 日本学会ガイドライン 2012, Chapt.5. ^ Cunningham, F (2009). Williams Obstetrics (23 ed.). McGraw Hill Professional. p. 210. ISBN 978-0-07-170285-0. http://books.google.ca/books?id=PYO2RUc4sQMC&q. ^ Shiri R, Karppinen J, Leino-Arjas P, Solovieva S, Viikari-Juntura E (January 2010). “The association between smoking and low back pain: a meta-analysis”. Am. J. Med. 123 (1): 87.e7–35. doi:10.1016/j.amjmed.2009.05.028. PMID 20102998. ^ Ehrlich GE (2003). “Low back pain”. Bull. World Health Organ. 81 (9): 671–6. PMC: 2572532. PMID 14710509. https://www.ncbi.nlm.nih.gov/pmc/articles/PMC2572532/. ^ 欧州の腰痛診療ガイドライン 2006, p. 11. ^ a b c d e Maharty DC (September 2012). “The history of lower back pain: a look "back" through the centuries”. Prim. Care 39 (3): 463–70. doi:10.1016/j.pop.2012.06.002. PMID 22958555. ^ a b c d e Lutz GK, Butzlaff M, Schultz-Venrath U (August 2003). “Looking back on back pain: trial and error of diagnoses in the 20th century”. Spine 28 (16): 1899–905. doi:10.1097/01.BRS.0000083365.41261.CF. PMID 12923482. ^ a b Borczuk, Pierre (July 2013). “An Evidence-Based Approach to the Evaluation and Treatment of Low Back Pin in the Emergency Department”. Emergency Medicine Practice 15 (7). http://www.ebmedicine.net/topics.php?paction=showTopic&topic_id=371. ^ a b Manchikanti L, Singh V, Datta S, Cohen SP, Hirsch JA, ASIPP (2009). “Comprehensive review of epidemiology, scope, and impact of spinal pain”. Pain Physician 12 (4): E35–70. PMID 19668291. Talmage, J; Belcourt, R; Galper, J; et al. (2011). “Low back disorders”. In Kurt T. Hegmann. Occupational medicine practice guidelines : evaluation and management of common health problems and functional recovery in workers (3rd ed.). Elk Grove Village, IL: American College of Occupational and Environmental Medicine. pp. 336, 373, 376-377. ISBN 978-0-615-45227-2. Qaseem, Amir; Wilt, Timothy J.; McLean, Robert M.; Forciea, Mary Ann (2017). “Noninvasive Treatments for Acute, Subacute, and Chronic Low Back Pain: A Clinical Practice Guideline From the American College of Physicians”. 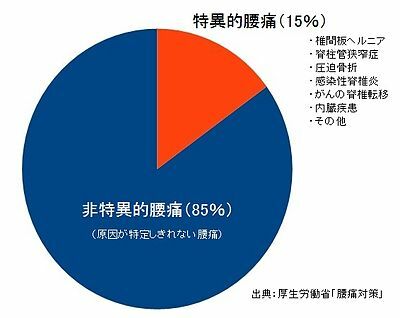 Annals of Internal Medicine (米国内科学会). doi:10.7326/M16-2367. ISSN 0003-4819. Chou R, Qaseem A, Snow V, Casey D, Cross JT, Shekelle P, Owens DK (2007). “Diagnosis and treatment of low back pain: a joint clinical practice guideline from the American College of Physicians and the American Pain Society”. Ann. Intern. Med. (米国内科学会) 147 (7): 478–91. doi:10.7326/0003-4819-147-7-200710020-00006. PMID 17909209. ﻿CG88: Low back pain in adults: early management﻿ (Report). 英国国立医療技術評価機構. (2009-04). https://www.nice.org.uk/Guidance/CG88. ﻿WHO IRIS: Low back pain initiative﻿ (Report). 世界保健機関. (1999). WHO/NCD/NCM/CRA/99.1. http://www.who.int/iris/handle/10665/66296.